Back in July, I talked about how distressing I find the current political and cultural environment. Thankfully I have moments of hope and optimism. I know this turmoil is leading us somewhere more peaceful, just and equitable and I want to do my part to help create that better place. What can you and I do? There are many worthy organizations to support, protests and marches to attend, political and civic engagement activities, and more. While any of these may be an effective path, I’d like to suggest there is an AND here. We can do the above things AND must do the internal work. 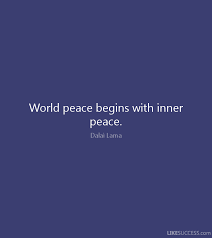 After years of self-healing, I’ve come to know this is true – obtaining joyous success requires the cultivation of inner peace — so when I recently heard the Dalai Lama say that world peace will only be attained when we each have inner peace I actually got chills. That’s right. We can’t have an equal, just, and peaceful world if our inner world is anything but. We can’t have great health, balance, and joy if our inner world is harsh, critical, and unloving. If we want to truly heal and live a great life, we have to treat the root cause of our suffering, not just the symptoms. The Civil Rights movement ended about 50 years ago. This tumultuous period resulted in landmark legislation that forbade discrimination on the basis of race and other criteria. However, changing the laws didn’t address the root cause of racism and white supremacy, it only addressed a symptom. Now we have to address the root cause – the hearts and minds of the people. It’s time for you to commit to your own health and well-being; to go from worn-out and burnt-out to joyful and thriving AND it’s time for you to do the difficult personal work necessary to bring about a more joyous, peaceful, and just world. Thankfully, they are connected so you get a two-fer for your efforts! The self-healing journey of the WOBO woman tells us the light of self-awareness is what liberates us; that clears away the false assumptions that keep us exhausted and trapped in old beliefs and habits that limit us and those around us. As Deepak Chopra said, “when you are aware, you begin to lead a more conscious life, this is enough to free you [and others too].” So whether it is eating better, exercising more, or eliminating your deepest biases and prejudices, everything starts with self-awareness. I’m on a mission to start a revolution of inner peace. Ready to revolt? Ask yourself, what 1 or 2 things can I do this week to improve my self-awareness? Keep a food-mood journal for a week. It will help you identify what you actually eat and how your eating habits and mood are connected. Start your day with 5-minutes of quiet time. Do something other than “up and at it!” See how it affects your stress levels when you move a little more slowly into your day. Take a yoga class. This moving meditation is the perfect solution for the hyperactive body and mind. Write down 3 things you are grateful for at the end of each day. We tend to focus on what’s not working that we forget how much is working. It’s an easy way to turn that frown upside down. Examine the ways you perpetuate the racial discrimination and oppression that is so engrained in our culture. Don’t judge start by identifying your prejudices and bias, big and small. On the flip side, identify the ways in which you’ve internalized the traumas of racism and prioritize the self-care required to heal. Here’s to your inner and our outer peace revolution! I’d love to hear what you’re doing to cultivate self-awareness and how it’s affecting change. Leave me a note in the comments below. Great advice, and all to easy to overlook when it’s us we should be taking care of!